Ritu Kumar ventures onto international shores with its first flagship store launch in Dubai. India’s leading fashion icon and Padma Shri awardee, Ritu Kumar and her son, Amrish Kumar proudly announced the opening of the new store located at the bustling BurJuman Mall, a premium destination for finest luxury brands in Dubai. With this new store, the Ritu Kumar brand has increased its presence to over 35 stores globally and is now working on massive expansion plans to increase its footprint within India. The store has been designed keeping in view the new contemporary look and feel of the brand and the layout reflects an innovative approach to interior design that puts Ritu Kumar’s collections at centre-stage.Spread over 1900 sq ft, the store seeks to offer the discerning Dubai populace a wide variety and range that has universal appeal. The store will stock the latest Spring Summer’14 collections from all three sub-brands; Label – Western pret apparel, Ritu Kumar – Ready to wear Indian ethnic apparel and Ri – Festive and occasion-wear. Announcing the launch, Amrish Kumar, CEO Ritu Kumar said, “We are extremely pleased to launch our first international store in Dubai and we see this as the beginning of our global footprint. 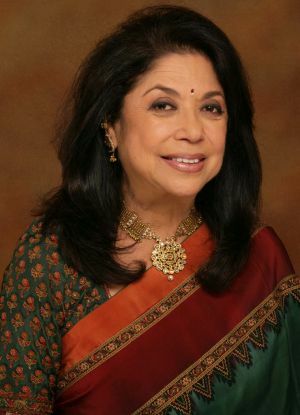 Ritu Kumar is one of India’s foremost designers. She has developed a unique style of her own, reflecting the ancient traditions of Indian craftsmanship in a contemporary vocabulary. While Ritu Kumar’s forte lies in traditional Indian clothes that draw heavily on the textile and embroidery heritage of India, she has also evolved another style for the young buyer, a collection that in her words has “redefined traditional handwriting to meet the changing needs of the new generation”. In 2002 Ritu Kumar, joined by her son Amrish, launched a sub brand Label Ritu Kumar. This is aimed at the young global Indian woman with a contemporary lifestyle.